Founded in 1804, the New-York Historical Society is the city’s oldest museum. 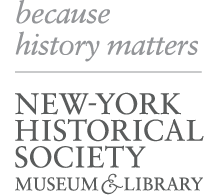 Members are partners in New-York Historical’s mission to engage a broad range of people in American history through groundbreaking exhibitions, stimulating programs, and educational initiatives that bring history and art to life. Membership helps New-York Historical care for its priceless collection, present engaging public programs and innovative exhibitions, and serve more than 200,000 New York City students, teachers, and young people each year. Become a Member today - it is only through your support that we can continue Making History Matter.